BELFAST, Northern Ireland, 2017-May-25 — /Travel PR News/ — Pupils at an east Belfast primary school are celebrating their favourite meal of the day at their Breakfast Club, thanks to a three-year commitment from George Best Belfast City Airport. 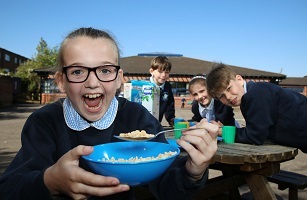 The financial support, first provided by the airport’s Community Fund in 2016, is being extended for another two years, ensuring pupils at Cregagh Primary School start their day with a nutritious breakfast that will sustain their energy and concentration levels until break time. The club is the latest to receive support from Belfast City Airport’s Community Fund which, now in its eighth year, has provided over £300,000 of financial support to over 100 local community projects and groups. “Often busy family lives can result in children having breakfast on the go or worse still- skipping breakfast altogether, which can potentially have a negative impact on their overall health and weight, their teeth and their ability to pay attention in school. This entry was posted in Airports, Business, Food & Drinks, Travel, Travel & Kids, Travel Management, Travelers and tagged Charlene Brooks, Cregagh Primary School breakfast club, David Heggarty, George Best Belfast City Airport, Stephen Patton, support. Bookmark the permalink.